she has to stop the wedding! At long last, Sadie Beecham has met The One…except, Daniel took one look at Sadie’s best friend Meg and fell head over heels in love! Anyone can see Meg and Daniel are all wrong for each other – it’s Sadie’s duty to show them the error of their ways, right? Nope. Not according to Trey Kincaid, Meg’s bossy older brother, who thinks it’s high time his sister settled down. He’ll do whatever it takes to stop Sadie busting up the big romance. But when did Sadie, the smart-aleck geek-next-door, develop such enticing curves? And when will she get it into her stubborn brain that she’s chasing after the wrong man? “Mom! I’ve brought guys home before.” Sadie stepped away from the beef bourguignon simmering on the stove for tonight’s celebratory dinner and patted her damp forehead with a paper towel. Her bungalow’s ancient air-conditioning wasn’t up to the challenge of keeping the kitchen cool during the heat of a Memphis summer. Sadie shuddered, and knew her mother was doing the same. That was a long time ago. A brief attempt during her sophomore year at Princeton to prove she could tread the wild side just like any other coed. A theory she’d rapidly disproved. The last thing she needed was her parents acting as if they were meeting a prospective son-in-law. Even if that’s exactly what he was. Sadie opened the kitchen window in the hope of creating a breeze. On the back porch, her latest batch of plants—camellias and limonium—had died in their pots, despite the expensive soil nutrients she’d fed them. The neighbor’s cat must have been doing its business in them again. “I want to know all about your young man,” Mary-Beth demanded. Sadie couldn’t help grinning in response to her mom’s enthusiasm. “He’s very nice,” she admitted. He’s perfect. The doorbell rang. Phew, saved from descending into girlish chitchat, a skill she’d never mastered. “Mom, I need to go. He’s just arrived. Meg gets back tonight, too, so we’re all having dinner.” Dinner for three—she couldn’t wait. “Okay, dear, you go. Give Meg a hug for me, tell her not to worry, we have her mom’s party well in hand. And call me soon. I can’t wait to tell people about this doctor of yours,” Mary-Beth added archly. Sadie puffed out an exasperated breath. “Mom, no need to tell the whole world.” She was still fending off inquiries from her parents’ friends about when she was going to win the Nobel Prize. Mary-Beth had made the exaggerated claim during her last visit, boasting about Sadie’s brilliance as a seed biologist. “Just your father, then,” her mom soothed. “Fine.” Behind Sadie, another long trill of the doorbell suggested impatience. Then a thump on the door, and the handle rattling. Seemed Daniel was as eager to see her as she was to see him. Sadie’s irritation evaporated. “Coming,” she sang. “My key’s buried somewhere in there.” Meg indicated the trundle suitcase next to her. She hugged Sadie. “The flight landed an hour early. It’s so great to be home. Six weeks was way too long…even if it was Paris.” She stood back as Sadie maneuvered the case over the threshold for her. “I hope so. I followed the recipe exactly, so as long as Martha Stewart knows what she’s talking about…” Having missed out on the cooking lessons her mom had given her sister, Sadie wasn’t as confident as she’d like to be. “Boarding school discipline,” Sadie reminded her. “My secret weapon. Besides, it’s not as if you’re here even when you are here,” she joked as she pulled a bottle of pinot grigio from the fridge. She didn’t know how Meg managed to sleep at all between her party lifestyle and her job. She reached over to the counter, where three wineglasses were neatly lined up. “Three glasses?” Jetlag or no, Meg didn’t miss a thing. “You’ve never looked slobbish in your life…and besides, he’s just a friend.” She didn’t want Meg getting over-excited the way her mom had. What was that supposed to mean? Sadie had listened to friends revealing their I’m-in-love stories over many a glass of wine, but she realized now she’d failed to observe the nuances. She hoped she wasn’t blushing. Top research scientists don’t blush, she told herself sternly. Meg took a slug of her wine and set her glass down. “Two minutes.” She patted Sadie’s arm, then headed to her bedroom. She’d never in her life freshened up in two minutes, so Sadie didn’t expect to see her for a while. She poured some wine for Daniel—pinot grigio was his favorite—and wiped up a few drops that had spilled on the stainless steel counter. She rinsed out the dishcloth and tucked it in the wire basket in the cupboard beneath the sink. The doorbell rang. Once. Briefly. That was Daniel, no impatient banging on the door or rattling the handle. A man confident in himself, who liked to do things right. Just like her. No wonder she’d fallen in love with him so fast. “Hi, Sadiebug.” Daniel had come up with the nickname the first time they’d had lunch together. She loved it. He stepped inside, his kiss landing at the corner of her mouth. Reminding her of the embrace they’d shared last night. Their first proper kiss, after a delicious dinner at the nearby Two Trees Grill, where they’d talked about their families, their ambitions, their mutual passions—work, Russian literature, 1980s rock music, running. Admittedly, running was a very new passion for Sadie—she’d better warn Meg not to look too surprised. Afterward, Daniel had brought her home and here in this very hallway had taken her in his arms. Then…the kiss. Remembering, Sadie felt a warm glow inside. Which she took to be a male version of wow. “Hmm,” she’d said happily back. “How was your day?” Sadie asked as she led the way to the kitchen. “Full-on. Our free diabetes testing was a crowd-puller. The few spare minutes I had were spent preparing for my meeting with the SeedTech panel tomorrow.” Daniel ran a medical clinic for low-income families in Memphis’s Northside neighborhoods. His interest in childhood nutrition had brought him to SeedTech, the botanical research firm where Sadie worked. Sick of always being “the ambulance at the bottom of this cliff,” he’d joined the panel that reviewed SeedTech’s research into medicinal plants, projects that in the long term would benefit poor people everywhere. Sadie had met him a few weeks ago when she presented her project to the panel. His grin made her heart flip. She would have loved him if he’d been ugly as sin, but his warm brown eyes and slightly-too-long hair – he worked so hard, he seldom found time to get a cut – were adorable. To us. Sadie sipped her wine and smiled. “Um…hi.” Meg spoke from the doorway. Sadie beamed. “Meg, meet Daniel. Daniel, this is my best friend Meg Kincaid.” She couldn’t have said who she was prouder of. Please let them like each other. Daniel drank in Meg’s silky dark hair, her long lashes, porcelain-perfect complexion, her sweet smile…his jaw dropped. Uh, maybe not quite that much. The natural pink of Meg’s cheeks deepened, her smile turned irresistible. How ironic that the first fault Sadie should find in Daniel was his rapid amnesia about that great kiss they’d shared. 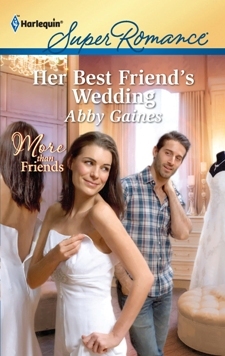 From the second he met Meg, his manner toward Sadie was no more than platonic. Warmly platonic, sure…. In a matter of a few days, Daniel and Meg were an item. Every time she saw him with Meg—and since they were at great pains not to exclude her, that was often—her heart cracked a little further. What she felt for him, what she thought they’d both felt, radiated in his face whenever he looked at Meg. She should refuse their invitations, but she found herself drawn to their relationship like a bug to a Venus flytrap. “Things still going well with Daniel?” she asked Meg one Saturday afternoon, as they wandered through a boutique on Beale Street in search of gifts for Meg’s mom’s sixtieth birthday. The party was only a week away. “Not sure if that would actually meet around your mom’s middle. So…you’ve been seeing each other, what, three weeks?” Three weeks, three days and eighteen hours by Sadie’s count. Overhead, the Muzak played Hopelessly Devoted to You. “I know what you’re thinking,” Meg said. Sadie let out a breath of relief. Meg was infamous for her intense but brief relationships. Sadie couldn’t remember the last time one of her boyfriends had survived more than six weeks. If Meg followed her usual pattern, Sadie just had to hold out another two and a half weeks, max. “I didn’t.” Had Meg ever used the words “right for each other” before? Sadie shivered in the air-conditioned store. “Don’t mention it,” Sadie said with wasted irony. The Muzak segued into Breaking Up is Hard to Do. A timely reminder to call her mom, who still thought Sadie was bringing a man to the party. She would phone home tonight and say she’d broken up with her doctor friend. Sadie and Daniel finished work early on Friday. Meg wasn’t flying that day, so by four o’clock the three of them were heading out of the city in Daniel’s Toyota Prius—he always tried to minimize his contribution to global warming. Weeks ago, when Sadie had envisaged this journey, she’d pictured her and Daniel up front, Meg in back. Instead, she was the gooseberry, trying to be sanguine about the dopey looks being traded in the front seat. Comforting herself with the thought that the natural life of this romance was probably another week and a half at best. “Are we there yet?” she chirped in imitation of her nephews and nieces, as they drove down Sanga Road in the heart of Cordova, once a small town but now an outer neighborhood of Memphis. She tried not to think about the disappointment her mom had struggled to hide on the phone at the news Sadie wasn’t bringing a date. She just had to get through the first few moments without anyone figuring out that Daniel and her “ex-boyfriend” were the same man. Her strategy was simple: put on her happy face and refuse to answer questions about her love-life. If that didn’t work, launch into a monologue about apomictic hybrid crops. Meg directed Daniel to make a left into Maple, and a moment later they pulled up outside the white-and-blue Victorian at number twenty-four, the Kincaids’ house. Sadie’s family lived next door at number twenty-six, an almost identical Victorian painted green with a red trim. Both houses’ front doors opened, then Mary-Beth Beecham and Nancy Kincaid hastened down to the car, hallooing greetings. Sadie almost said terrified, then realized the question was aimed at Daniel. “Only because it’s so important,” he said tenderly. Fighting an uncharitable gag reflex, Sadie snapped open the car door and clambered out. Before she could utter the words she’d been steeling herself for, words she hadn’t yet quite managed to say in her own head—This is Daniel, Meg’s boyfriend—a truck pulled up at the curb. A shiny, black Ford F-150, which in this former farming hamlet had the desirability factor of a Ferrari in the city. The man who climbed out was broad-shouldered, lean-hipped, laconic in jeans and black T-shirt. “Trey,” Meg squealed. As her brother hit the central lock she ran out on the road and threw her arms around him. “Yeah, yeah, Meggie.” Trey Kincaid made a half-hearted effort to disengage. Their sibling relationship was a blend of loyalty and sniping in varying proportions. For the past ten years, sniping had been dominant, but absence must have temporarily tipped the scales the other direction. Meg dragged Trey to the curb—not that she could have budged him an inch if he didn’t want to move—chattering all the way. Trey’s chin jerked back, and he looked harder at her. “Uh, hi,” he said, as if he’d forgotten he’d already said that. His gaze flicked over her curves, down her legs, then up again. He looked confused. Then alarmed. Good grief, he thought her smile was about his supposed gorgeousness. Sadie hadn’t attended Andrew Johnson High, the local school, but she knew from Meg that as quarterback, Trey had always had a bevy of cheerleaders around him—the attention had obviously gone to his head and stayed there. Her mother hugged both Daniel and Meg. “Don’t you two make the cutest couple?” Her gaze darted in Sadie’s direction, the nearest she would get to expressing regret that her daughter’s big romance had fallen through. Meg introduced her brother to her beau. As the two men shook hands, Trey subjected Daniel to a long, hard scrutiny. “You finally chose one who looks like he can hold down a job.” Typical of Trey not to bother to hide his surprise. But then, he’d never possessed the good manners Sadie admired in Daniel. Then, too, Meg had had some “interesting” boyfriends over the years. “He’s a doctor,” Meg said proudly. “And a Tigers fan.” Trey was a longtime supporter of the Memphis Tigers baseball team. “Did you see that whitewash against the Braves last week?” Trey asked. He and Daniel spent a minute rehashing the game. As they talked, Daniel laced his fingers through Meg’s and smiled down at her. Sadie looked away, though she’d been forced to observe far worse recently. “Do you fish?” Trey asked, when the baseball conversation petered out. Daniel’s gaze wavered. Sadie couldn’t picture him sitting in a boat for hours on the off-chance a fish might come along. “Happy to give it a try,” he said. The day took on a surreal hue. As far as Sadie knew, Trey had never put himself out for one of Meg’s admirers. Now he was offering to share his fishing spot on the lake, a local legend whose exact location was known only to him. Ha, ha, ha, Sadie thought sourly. She realized Trey’s gaze had narrowed on her. That while everyone else listened to Meg rattling on about Sadie’s incredible intuition, introducing her and Daniel, he had been observing her. At barely five o’clock the temperature was nowhere near the mid-nineties that had dominated the afternoon. She straightened away from Daniel. “I’m fine, but thanks for your concern,” she said crisply. Not quite: in the old days, Meg’s father, Brian, had presided over the grill alongside Sadie’s dad, and her oldest brother Logan regularly defended his record for consuming the most burgers in one night. But Brian and Logan Kincaid had died in a fishing accident when Sadie and Meg were high school seniors. Trey had given up his college football scholarship to take his father’s place running Kincaid Nurseries, the family garden center. Turned out he was a natural businessman, just as he was a football player—over the years he’d added more garden centers in surrounding neighborhoods. Sadie watched Daniel and Meg walk up the path through Nancy’s spectacular front garden. Her own parents’ garden was equally impressive—Sadie’s mom and dad had taken turns presiding over the Cordova Garden Club, and Kincaid Nurseries was the club’s number one sponsor. As next-door neighbors, the two families were a match made in heaven. Sadie turned away before she could watch Meg and Daniel walk into the house. Shutting her out. One weekend. I can survive one weekend.